Sometimes a single picture is worth a thousand words. This is one. 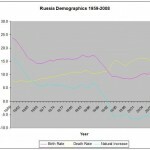 Though Russia remains a highly dangerous country by developed country standards, it has improved immeasurably in the past decade. 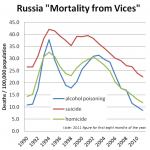 Fewer Russians today die from alcohol poisonings, homicides, suicides, and even – despite a near doubling of car ownership rates – transport accidents that they did in the 1990’s to early 2000’s. Indeed, most of these “non-natural deaths” indicators are back to the levels of the late 1980’s, coinciding with Gorbachev’s anti-alcohol campaign. The importance of this decline shouldn’t be understated. Though they only account for a small proportion of total deaths, they tend to happen at earlier ages and thus have a significant impact on the workforce and overall life expectancy. 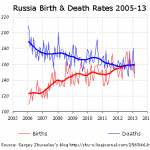 Furthermore, the fact that the pace of improvements actually speeded up during the crisis indicates that Russia is becoming a “normal country” in the sense that health improvement trends have decoupled from economic fluctuations.